To celebrate a new year and hopefully a better year PaperTemptress is offering FREE SHIPPING on the very gorgeous Valentine Day Speciality Pkg which works out to let you only pay $2.25 to ship up to another 50 sheets of any cardstock including any of the Copic Blending cardstock and only $7 shipping for up to another 400 sheets so a PERFECT time to add speciality cardstock to your paper stash! The gorgeous Valentine Day Speciality pkg is 22 sheets of gorgeous specialty cardstock that coordinates to design very special Valentine Day cards... Here are the sheets of gorgeous cardstock that is included in the Valentine Day Speciality Pkg. Also on sale @ PaperTemptress.com. 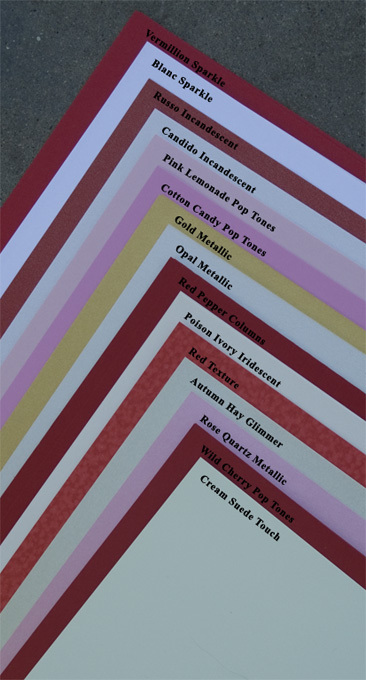 the whole Gorgeous 105# Mica/Metallic paper line is 25% off....plus all 12 sheets of Vellum is 30% off...great time to add GORGEOUS cardstock to help take your designs from great to AMAZING! Time for me to make my valentine cards! Word Art Wednesday! and a Freebie!